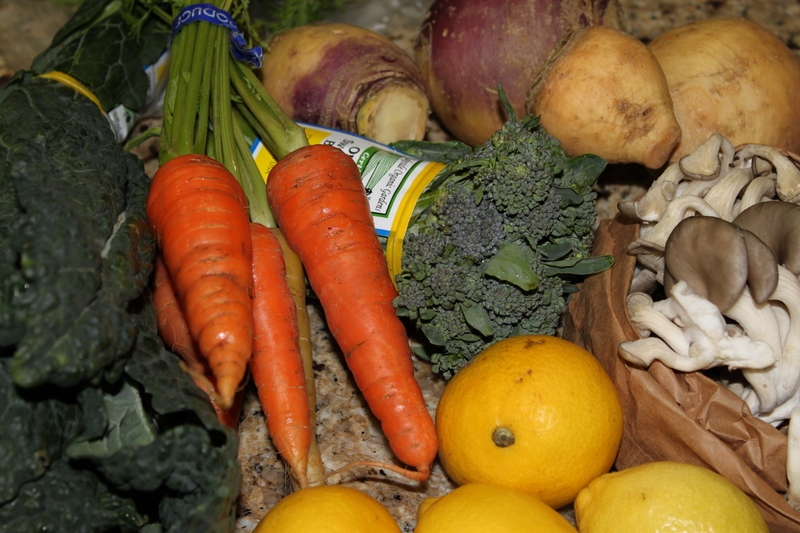 This week, I added a few new items – oyster mushrooms and rutabagas. I have no idea what I am going to make with the rutabagas, but I did find this Bobby Flay recipe for the mushrooms, which sounds delicious (minus the wine of course). Did you hear that kale is the new beef? There’s been an article that has been popping up in my twitter feed everywhere, so it only seemed appropriate to include it in my delivery. Broccoli and carrots completed my veggie round up. I included lemons in my delivery because my tree doesn’t have any ripe fruit on it yet. I have been drinking a cup of hot water with the juice of half a lemon about 30 minutes before breakfast, and I found that my digestion throughout the day is fantastic. You just have to remember to at least rinse your mouth (or brush) after drinking this, because the acidic nature of the lemon can break down the enamel on your teeth. The good news is that lemon consumed in this form actually has alkaline properties – but that’s a whole blog post unto itself!